The importance of the "Moscicki resignation" question is that it reveals that after Moscicki and the Polish government had crossed into Rumania on September 17, 1939, Poland had no government at all. 1. Moscicki knew there was no other President of Poland (he had not resigned). Yet he could not be President because he could not carry out any official functions while interned in Rumania. Therefore, Poland had no government. (b) this would anger Hitler, since resignation is a political act, while Rumania was obligated by its neutrality to prevent the interned Polish government from any political acts. For Rumania to permit the Polish government to carry out political acts would be an act incompatible with its neutrality -- in effect, an act hostile to Germany. Therefore Rumanian authorities made up a false story that Moscicki had already resigned on September 15, while he was still in Poland and, therefore, still President of Poland. The problem was that Moscicki was still "expressing the wish to resign" on September 29 -- something he would not have done, of course, had he really resigned on September 15! 1. 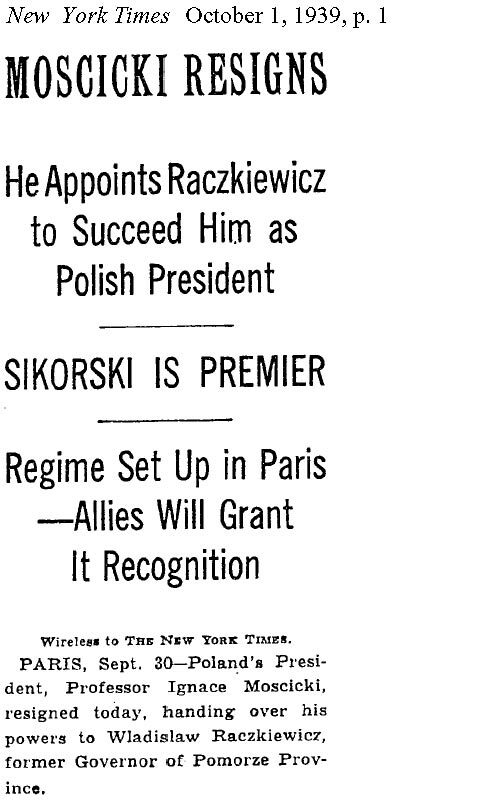 President Ignaz Moscicki of Poland "expressed the wish to resign on September 29, 1939. 2. 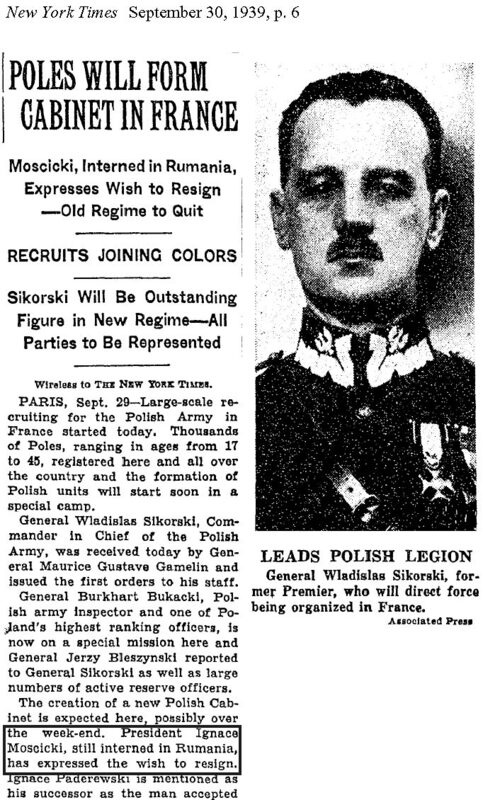 The next day Moscicki claimed that he did resign on September 30, after leaving Rumania as a private citizen (New York Times 10.01.39, p. 1). Moscicki needed to say this in order to appear to give a legal basis  a fig-leaf, at least  for the Polish Government-in-Exile being formed in France. The Rumanian government knew that Moscicki could not legally resign when interned in Rumania. If Rumania permitted the Polish government to function as a government -- i.e. refused to intern them -- it would be guilty of an act hostile to Germany, since Germany was at war with Poland and Rumania was neutral. In reality Moscicki could not resign. Resignation is an official act. Only a government official can resign. 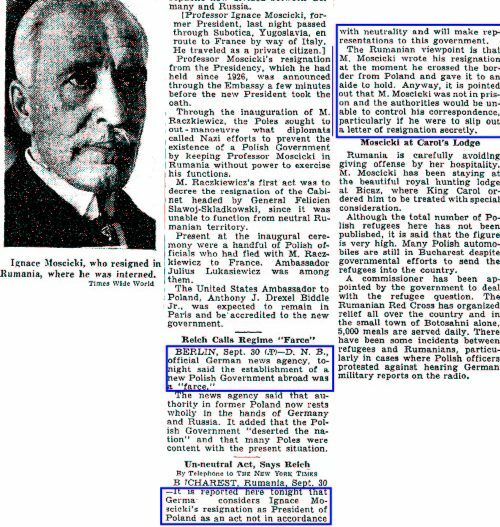 Moscicki was interned in Rumania, and therefore not a government official.